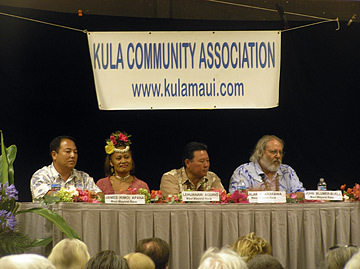 Among the Maui mayoral candidates appearing at an Aug. 30 Kula Community Association forum were Kimo Apana, left, Lehuanani Aquino, Alan Arakawa and John Blumer-Buell. WAILUKU » Maui County Mayor Alan Arakawa faces eight challengers in a nonpartisan primary, potentially fractionalizing his support. Former Mayor James "Kimo" Apana, a Democrat who lost his mayoral seat to Arakawa in a close 2002 election, is running again. Also running is Councilman Dain Kane, a Democrat who once served as Council chairman. The major vote-splitter for Arakawa is expected to be Councilwoman Charmaine Tavares, daughter of the late Republican Mayor Hannibal Tavares. Both Tavares and Arakawa have run as Republicans in the past and attracted Democratic swing voters. Saying he has better problem-solving skills than Arakawa and other candidates, Apana points out he started the county bus system and was able to work with the state to widen Piilani Highway in South Maui in four years. Kane was against Arakawa's proposed $10.5 million acquisition of One Main Plaza as a county facility because of repair worries -- a purchase that Arakawa maintains was a good decision, as evidenced by the rent paid by the county to occupy the building. Tavares, a former county parks director, supported One Main Plaza. Other mayoral candidates include self-described Hawaiian princess Lehuanani Aquino, Hana community activist John Blumer-Buell, veterans rights advocate William F. Stroud, trucking operator Nelson Waikiki Jr. and real estate agent Harold "Hap" Miller. Under the County Charter, the two top vote-getters for mayor will advance to the general election.